In the words of Dr. Douglas Zipes, "the AV [atrioventricular] node is the 'soul'' of the heart, and whoever understands its anatomy and electrophysiology will unlock the key to understanding the anatomical and electrical workings of the heart itself. This book reviews what we know and do not know about the AV node, and as such, serves as a good road map in our search for that elusive key." The book is divided into two parts, basic and clinical. The basic chapters discuss the fundamentals of AV nodal anatomy and morphology in the normal and diseased heart, the principles of slow conduction, the functional property of the transmission through the AV node, its cellular electrophysiology, its control by the autonomic nervous system as well as its behavior and participation in arrhythmias such as atrial fibrillation. The clinical chapters are devoted to a wide array of problems, including the clinical pharmacology of the AV nodal conduction, slow and fast pathway ablation in AV nodal reentrant tachycardia, unusual electrophysiology of the human AV node in relation to AV nodal reentrant tachycardia, AV nodal modification and/or ablation for control of ventricular rate during atrial fibrillation, and the effects of radiofrequency ablation on autonomic regulation of the AV node. Renowned specialists from around the globe share their different, sometimes controversial, opinions on these subjects, thus giving the reader the opportunity to evaluate the current knowledge through the experience of different schools. This book was written to serve as an important source of information for cardiologists, electrophysiologists, anatomopathologists, biophysicists, and biomedical engineers. The authors believe it will be useful "both for those that remember the growth of our knowledge in the past (20th) century, and for those that will finally be able to resolve the remaining mysteries in the next." Todor N. Mazgalev Ph.D and Patrick J. Tchou M.D. 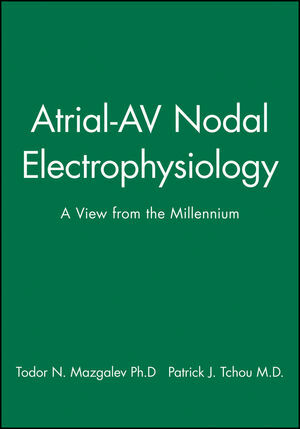 are the authors of Atrial-AV Nodal Electrophysiology: A View from the Millennium, published by Wiley. Part I. Anatomy and Basic Electrophysiology of the AV Nodal Conduction. Chapter 1. The Atrial Connections of the Specialized Axis Responsible for AV Conduction. Robert H. Anderson and Siew Yen Ho. Chapter 2. Anatomic-Morphologic Relations Between AV Nodal Structure and Function in the Normal and Diseased Heart. Chapter 3. Historical Perspective of Studies on Impulse Formation and Conduction in the AV Node. Yoshio Watanabe and Tadayoshi Hata. Chapter 4. Principles of Slow Conduction in Cardiac Tissue: Mathematical Modeling. Chapter 5. Principles of Slow and Discontinuous Conduction: Experimental Observations. André G. Kléber, Jan P. Kucera, and Stephan Rohr. Chapter 6. Spatial Distribution of Ion Channels, Receptors, and Innervation in the AV Node. Kevin Petrecca and Alvin Shrier. Chapter 7. Distribution and Function of Gap Junction Proteins in Atrial-AV Nodal Conduction. Jeffrey E. Saffitz, Kathryn A. Yamada, and Richard B. Schuessler. Chapter 8. Cellular Pharmacology of AV Nodal Conduction and Automaticity. Tadayoshi Hata and Yoshio Watanabe. Chapter 9. Mechanisms of Vagosympathetic Control of the Atrial-AV Nodal Conduction. Don W. Wallick, Sherry L. Stuesse, and Matthew N. Levy. Chapter 10. Functional Properties of the AV Node: Characterization and Role in Cardiac Rhythms. Jacques Billette and Farid Amellal. Chapter 11. Is the Atrium Involved in AV Nodal Reentry?. Michiel J. Janse, Peter Loh, and Jacques M.T. de Bakker. Chapter 12. What is the Slow AV Nodal Pathway?. Chapter 13. The AV Conjunction: A Concept Based on Ablation Techniques in the Normal Heart. Benjamin J. Scherlag, Eugene Patterson, William Yamanashi, Warren M. Jackman, and Ralph Lazzara. Chapter 14. The AV Nodal Dual Pathway Electrophysiology: Still a Controversial Concept. Todor N. Mazgalev and Patrick J. Tchou. Chapter 15. Autonomic Modulation of AV Nodal Conduction. Josef Kautzner, Marek Malik, and A. John Camm. Chapter 16. AV Node Function During Atrial Fibrillation. Frits L. Meijler and José Jalife. Chapter 17. Role of the AV Nodal Inputs for Modulation of the Ventricular Rate During Atrial Fibrillation. Stéphane X. Garrigue and Todor N. Mazgalev. Chapter 18. Fluorescent Imaging of Electrical Activity in the AV Node of Rabbit Heart. Igor R. Efimov and Todor N. Mazgalev. Part II. Clinical Electrophysiology of the AV Nodal Conduction. Chapter 19. Clinical Pharmacology of AV Nodal Conduction. John P. DiMarco and Michael Drucker. Chapter 20. Remodeling of the Atria During Atrial Fibrillation. David R. van Wagoner, Jeanne M. Nerbonne, and Albert L. Waldo. Chapter 21. Dual Atrionodal Physiology in the Human Heart. Steven M. Markowitz, Kenneth M. Stein, Suneet Mittal, and Bruce B. Lerman. Chapter 22. Electrocardiographic Manifestations of Dual AV Nodal Conduction During Sinus Rhythm. Chapter 23. Slow And Fast Pathway Ablation in AV Nodal Reentrant Tachycardia: Anatomic Approaches and Pathway Potentials. Michel Haïssaguerre, Dipen C. Shah, Pierre Jaïs, Atsushi Takahashi, Mélèze Hocini, Stéphane Garrigue, and Jacques Clémenty. Chapter 24. Unusual Electrophysiology of the Human AV Node in Relation to AV Nodal Reentrant Tachycardia. Part I: Multiple AV Nodal Pathways. Part II: Continuous AV Nodal Function Curves. Shih-Ann Chen, Ching-Tai Tai, Chern-En Chiang, and Mau-Song Chang. Chapter 25. The Reentry Circuit for Slow/Fast AV Nodal Reentrant Tachycardia. Kenichiro Otomo, Zulu Wang, Karen J. Beckman, Peter Spector, Hiroshi Nakagawa, Kagari Matsudaira, Eugene Patterson, Ralph Lazzara, and Warren M. Jackman. Chapter 26. Autonomic Effects on the Human AV Node. Chapter 27. AV Nodal Modification for Ventricular Rate Control of Atrial Fibrillation. Allan C. Skanes, Andrew D. Krahn, Raymond Yee, and George J. Klein. Chapter 28. AV Node Ablation for Ventricular Rate Control of Atrial Fibrillation. Christopher R. Cole and Mina K. Chung. Chapter 29. Autonomic Effects of Radiofrequency Catheter Ablation. Mary R. Olsovsky and Kenneth A. Ellenbogen. * the first book entirely devoted to the electrophysiology of the atrioventricular nodal conduction, written by world-renowned specialists.